On 28 February 2013 I was one of 17 tasters taking part in the Judgment of Parsons Green. This annual shoot-out between a comprehensive selection of English sparkling wines with some wildcards thrown in was conceived and organised by English wine consultant Stephen Skelton MW. As it represents a rare opportunity to taste so many English sparkling wines in a blind context, the Judgement of Parsons Green is something I would normally attend at a drop of Mr Fizz’s hat, but due to travelling commitment I was abroad when the first two events took place. Stephen brought forward the third Judgement, enabling me to accept for once, consequently I was looking forward to the tasting, and it was well worth the wait. It is called the Judgement of Parsons Green as a nod to the more famous Judgement of Paris in 1976, a Steven Spurrier initiative that resulted in French judges rating Californian wines over many of the greatest Bordeaux and Burgundy. 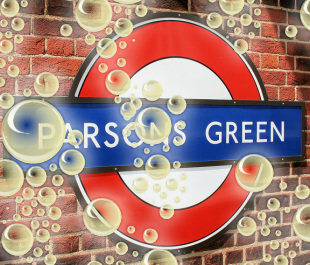 Rather than Paris, Stephen’s competitive event is held in Parsons Green (so-called because the vicar of Fulham used to live there). At the Judgement of Parsons Green III there were 79 English sparkling wines and 5 wildcards, which comprised of four different wines: three Champagnes (one of which was duplicated) and one Californian wine. With 17 tasters no one expects to agree with all the results, but I concurred on a fair number of the overall Top 30 and some wines that did not make my list were close runners-up. I drew my line at a Top 26: that broke down into seven groups of equally placed wines, and with 11 wines in the eighth group, a Top 37 would have been too many. The overall positions are down the left-hand side, with my positions on the right. Two things immediately threw me about the overall order. The first was how high up the chart Roederer Estate Quartet came. Not because I do not rate it. I do. In fact I was the first to rate Roederer Estate as world class in the 1980s. But there were serious problems with the specific bottle we tasted. It was full of mercaptans: methyl mercaptans from the smell of stale cabbage and stagnant water. This is not typical of Roederer Estate and suggests that it had suffered from warm storage at some point. I couldn’t believe its position, especially as Stephen Skelton had kindly sent me the median scores of the other tasters to compare with my own and the Roederer Estate was one of seven equal top wines. Some people tend to ignore or forget the aromas on a sparkling wine for fear of getting a nose-full of CO2, but we had a roomful of good tasters, some of them seriously good. I contacted Essi Avellan, a Finnish MW who had flown in especially for the event and the best natural Champagne and sparkling wine taster I’ve met. Was I the only one to notice? Apparently not. She told me “I was troubled by the mercaptans on what I thought otherwise was a very nice wine, hence my low points, although not as low as yours.” My score was indeed very low, but it is not in me to be lenient of any faulty wine, however nice it might otherwise be. I am disappointed when a fault has spoiled what should be an excellent wine, but it should be scored for what it is. The second thing that I found odd was that the Top 30 did not coincide with the top 30 median scores. Evidently there is no argument between this taster and the group results for first and second place, but what is probably the most impressive aspect of the achievement by Wyfold and Theale is that they are both owned by Laithwaite (of Sunday Times Wine Club, Direct Wines, Averys, Virgin Wines and, of course, Laithwaites itself) and both vinified by Ridgeview. They must be doing something right. It should also be pointed out that from my ratings, Ridgeview Victoria Rosé should be up there with the Wyfold. It’s as good as the best rosés from Nyetimber and Camel Valley (the latter of which, for some reason, possibly the timing of its disgorgement, I always appreciate more in the September-December period). However, if we are keeping to a Top 30 or, in my case, a Top 26, there are other wines that deserve to be mentioned in the same breath. Chapel Down Blanc de Blanc 2007 (£26.99), for example. Not my favourite producer, I must admit. Too inconsistent, but within that inconsistency Chapel Down can come up with a little gem and this blanc de blancs was a good example of that. It came equal second on my scoring and a couple of months later Stephen Skelton’s panel at the Decanter World Wine Awards thought it deserved not just a gold medal, but a regional trophy. Three wines missing from the official Top 30 that deserved equal fourth place as far as I was concerned: Bluebell Estates Hindleap Seyval Blanc 2010 (£25.00) might be a touch on the sweet side, but it does show that of all the funny-money grapes grown in this country for climatic reasons, Seyval Blanc is best suited to autolysis, if and when it can be grown to produce relatively neutral fruit; Charles Palmer Brut 2009 (£55.00) is a new one on me, with a lovely smooth mousse, which I found particularly impressive and a slow-building, gentle richness of fruit. Quite remarkable for a first vintage of less than a thousand bottles! And Herbert Hall Brut 2010 £24.00 is as beautifully focused as its previous vintage, with just as much potential. There were three additional equal fifth wines: I have been known to empty a bottle of Camel Valley Brut 2010 (£24.95), despite its funny-money contents, and the 2010 doesn’t give me any reason to stop now, although I really prefer the Lindo’s Pinot Noir Rosé when it has had another 6-7 months post-disgorgement ageing. Langham Wine Estate Blanc de Noirs 2010 (£24.00) is another new English wine experience for me, and with typical blanc de noirs richness yet no excessive weight, it promises a lot and as Essi had this as her equal first (with Wyfold), she was obviously even more impressed than I was; and what more could you ask from the Southcott Rosé 2010 (£23.99) than its extremely pale colour and lovely, elegant fruit, with a typically English crisp finish? The additional equal sixth was the very pale Meopham Sparkling Rosé 2009 (£21.00). Some were put off by its high acidity and to be fair my note did state “bracing acidity”, but bracing acidity is part of the typicity of English sparkling wine and if English sparkling wine is to carve a permanent niche in the global market, we need to embrace its typicity. The final three wines in my Top 26 all ranked equal seventh: Eastcott Brut Rosé 2010 (£24.50), which is Seyval Blanc with Rondo for colour – as good a rosé I have tasted from a Seyval-based blend; Ridgeview Bloomsbury 2010 (£24.95), a soft, fresh, easy drinking brut with smooth mousse that is excellent, even if in the group scoring system it fell well short of the Top 30; and Sharpham Sparkling NV £29.95, a blend of predominantly black grapes. Although Stephen is correct: a median score (literally the middle score when all the scores are listed in numerical order or, if there are an even number of tasters, an average of the two middle scores) is generally less influenced by high and low scores; there are many circumstances where it can be far more ludicrous than an average. However, there is no fair or meaningful method of interpreting all the scores of any tasting panel, particularly one with so many tasters, so Stephen’s method did not bother me any more than other ways of calculating the results. Having received the Top 30 list I immediately requested the complete results. Stephen kindly sent me the median scores of the other 16 tasters for all wines, but the more I studied the data, the less sense I could make of it. The first seven positions were all from the highest median group and looked right. After that, however, the median scores were not only out of order, but there were five wines with lower than Top 30 median scores included, thus five with higher medians had been excluded. Not having median scores for all 17 tasters, it was impossible to check with absolute accuracy of course, but as the median for 16 scores is the average of its 8th and 9th score, and the median for all 17 tasters is the 9th score alone, I knew that the medians Stephen used for ranking must be very similar to the median scores he supplied, especially as just one point separated the first wine from the last in the Top 30. There is so little wriggle room between the wines that the only significant difference should be the positioning Stephen achieved by using the average scores to order those wines that shared the same median score. Of course, I accepted that was how Stephen had intended to do it and I most certainly was not questioning his integrity (he is retained as a consultant by one producers who did not do particularly well in this tasting), but something was odd with the results and we all make mistakes. When he feels inclined to put his journalist hat on, he should ask himself what a good journalist should do: accept what he is told without question or start digging when things do not add up. But the more I pushed, the more he dug his heels in: “If you want to chat about it fine, call me, but I am not giving out any more details about the scoring. I have worked out what the ranking by what I consider to be a fair system. It’s the system I have used for three years and no one – producer, judge or anyone at all – has ever questioned it before.” Frankly I was sick and fed up with telling Stephen I was not questioning the system, I just wanted to verify the results. I don’t care if no one else has ever questioned anything. This is a competitive event and as such needs a certain transparency for validity going forward. Not transparency to the point of opening up everything for public inspection, but simply by providing every taster with, if requested, a spreadsheet of all the scores. It’s Stephen Skelton’s event, so the method of interpreting the results is entirely down to him and if anyone disagrees with the system he chooses, that taster should not take part. However, having taken part and having given permission to use his or her name, Stephen has a duty to that taster to demonstrate that his or her scores have been properly used. Instead of taking offense, he should treat this as an added safeguard. I hope that Stephen Skelton takes this on the chin because this has become a supremely useful event for those in the trade and wine writers who want to keep up with producers of English (and sometimes Welsh) sparkling wines. Note: If Stephen Skelton would like to reply, his reply will be added here. Tom Cannavan, Publisher and Editor.